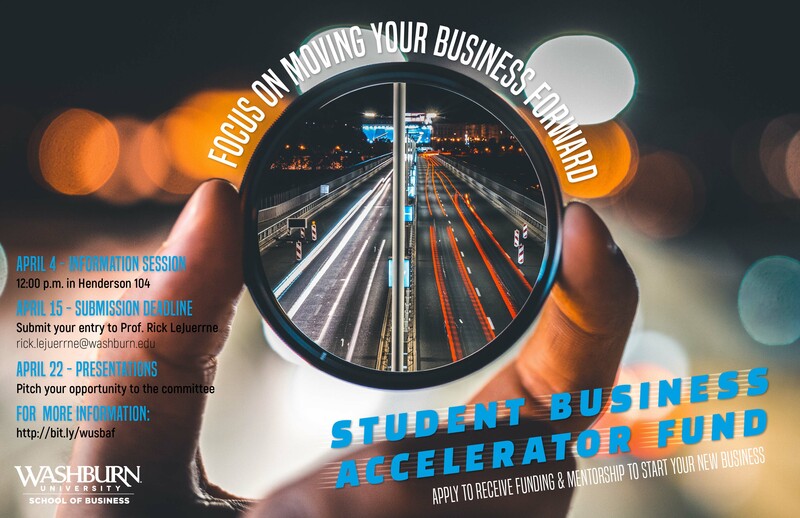 The Student Business Accelerator Fund (SBAF) is designed to create and advance a culture of entrepreneurship at Washburn University by supporting student startup ventures. All Washburn students are eligible for funding, as well as alumni who are within two years of graduation. This includes those in the Entrepreneurship & Innovation Program, Entrepreneurship Certificate Program, School of Business, Washburn Technical Institute, and all other disciplines, graduate and undergraduate. SBAF is supported by our alumni, who believe strongly in supporting our students and their entrepreneurial initiatives. All funding is structured as an award grant, not a loan. Washburn University takes no equity in the student company. There are no fees associated with the funding. One member of the startup team must have a WU affiliation by being enrolled or previously enrolled in a Washburn graduate or undergraduate program. WU students can apply up to two years after graduating from the University. The member of the startup team with WU affiliation must must have a majority ownership stake in the company. Startup teams can be all sizes, but typically include 2-3 founders. Companies can enter the program at various stages of development, including startup and early-stage. Entrepreneurs that are interested in pursuing funding from the SBAF program apply for funding by submitting a registration form and business plan. The business plan must explain how the requested funds will be used. Examples of use of funds include product development (e.g. prototyping), marketing (e.g. web development), legal needs (e.g. intellectual property issues), and human resources (staffing) and startup equipment and expenses. It is highly recommended that applicants share in their business plan the key milestones that will be accomplished by the use of funds. Registration forms are available here or in the School of Business office in Henderson building, room HC114. Deadline: Friday, April 12, 2019, 5 p.m. Please email both 1) registration form and 2) business plan to Hailey Handy hailey.handy@washburn.edu in the School of Business. A pre-screening committee first reviews applications and business plans. Funding proposals are screened on a standard set of categories to decide which companies will present their plan and undergo the due diligence investigation. After the initial review, companies receiving the highest scores will be notified and asked to present to the SBAF committee for funding. Friday, April 26 from 1-4 pm, Henderson Learning Center room 104. After all presentations have been made, the SBAF committee will evaluate the funding proposals based on the business plan, student presentation, and funding proposal. Additional due diligence may be required resulting in a request for additional information or revision of the funding proposal. This process can take 2-3 weeks before a final funding decision is made. The SBAF committee will notify applicants once the committee has made their final investment decision – this can take up to four weeks after the presentation, although notifications are typically made sooner than this. Upon the notice of award, all successful applicants must enter into a signed agreement between Washburn University School of Business and the student company for the disbursement of funds. Funding amounts vary considerably depending on the situation, and the process for the distribution of funds will be made available after the agreement is in place. Closing a deal is only the beginning of the SBAF program experience. Newly-funded companies will have access to a network of contacts and experienced professionals who can provide valuable guidance for the growth and success of their company. It is expected that students who receive funding will report the use and management of the funds, as well as key milestones to the committee over a two-year period after the award is made. Each student company that receives funding will be assigned a mentor to provide advice and assistance over the two-year period. Successful student applications are required to communicate with their assigned mentor once per quarter during the first year and report to the committee at the end of the first year of operations (during SBAF presentations). If you have questions or would like more information about the SBAF program, contact Rick LeJuerrne at 785-670-1306 or rick.lejuerrne@washburn.edu. He is located in Henderson Resource Learning Center, room 310E.